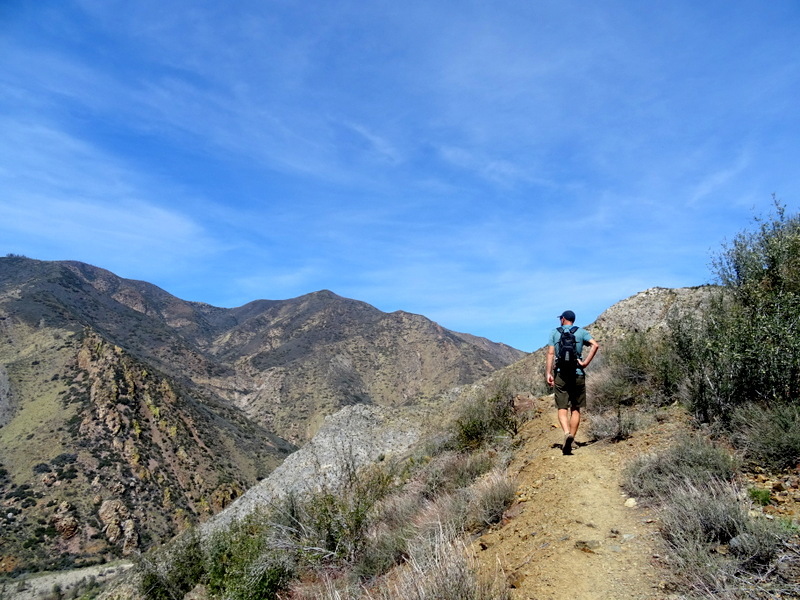 After six weeks on the Southern California coast, we were more than ready to head to the mountains. But with snow and freezing temps lingering at higher elevations we had to find an in-between spot. Somewhere that would allow us to experience a taste of mountain life without freezing at night or running into road closures. 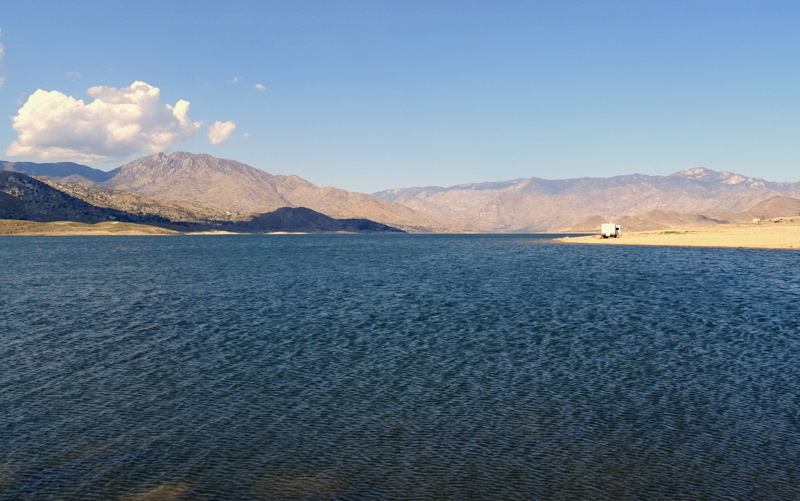 Lake Isabella perfectly fit the bill. 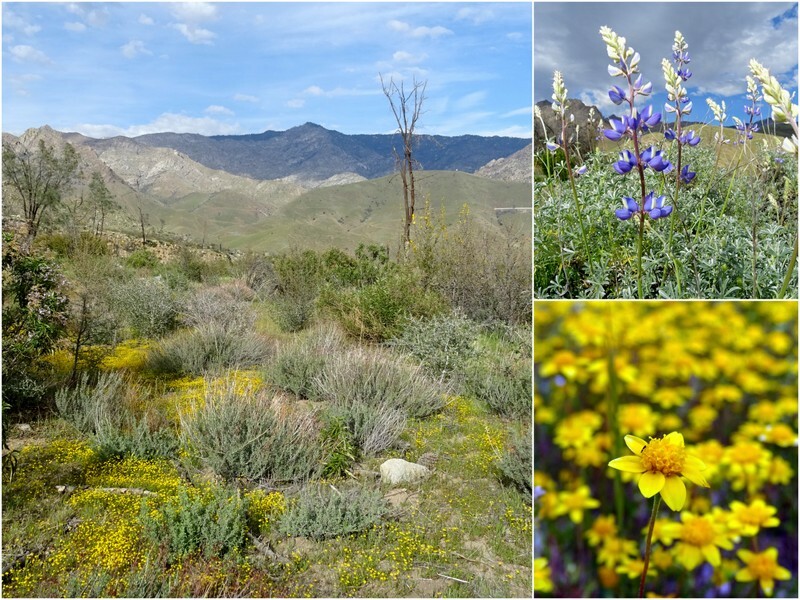 Located at the very southern end of the Sierra Nevada Mountains, this area is known to outdoor enthusiasts for hiking and water sports. 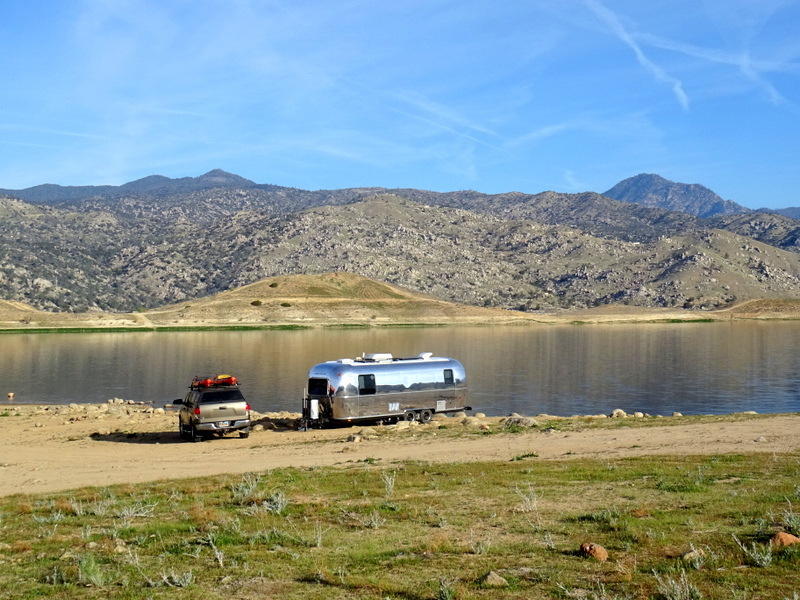 We arrived at the Auxillary Dam camping area on the Saturday before Easter. It was busy. Large groups clustered by the shore while boats and windsurfers zipped around the lake. Not feeling like scouting all over for a less busy area, we found ourselves a level spot away from the madness and happily settled in. 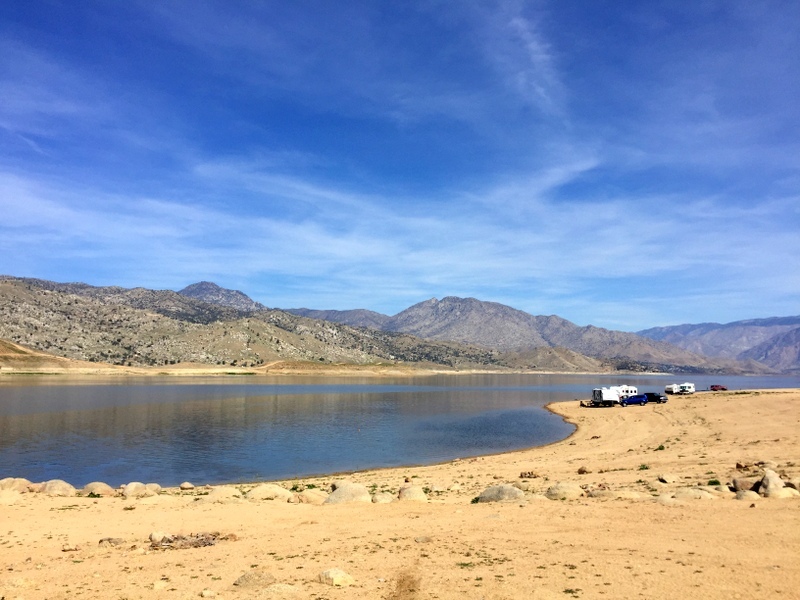 The Auxially Dam Campground is technically a paid dispersed camping area but with any federal pass (annual, oldie, or access) there is no cost. Without the pass, it’s $10/day. For your money (or for free) you get access to one restroom, several port-o-lets, a couple of dumpsters, fresh water, and a dump station (with a $10 fee). 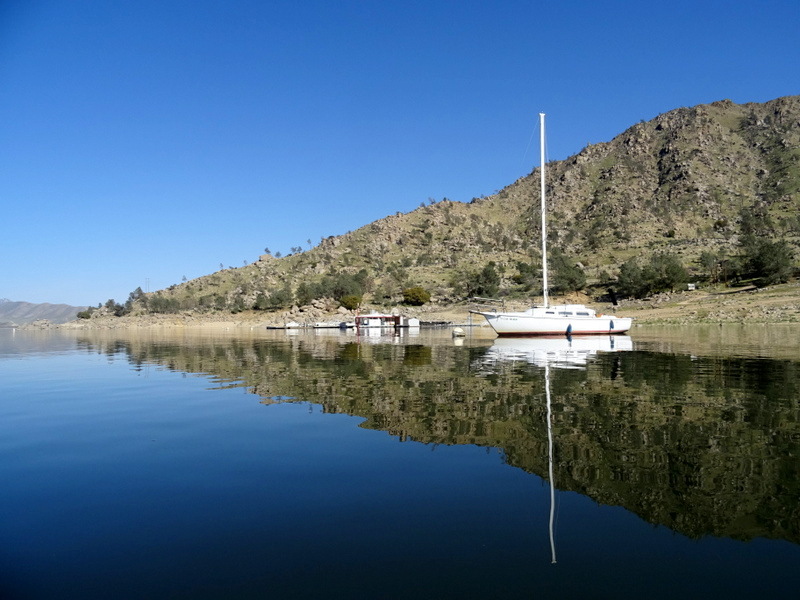 Combine all that with easy lake access and it’s easy to understand why it’s a popular spot. 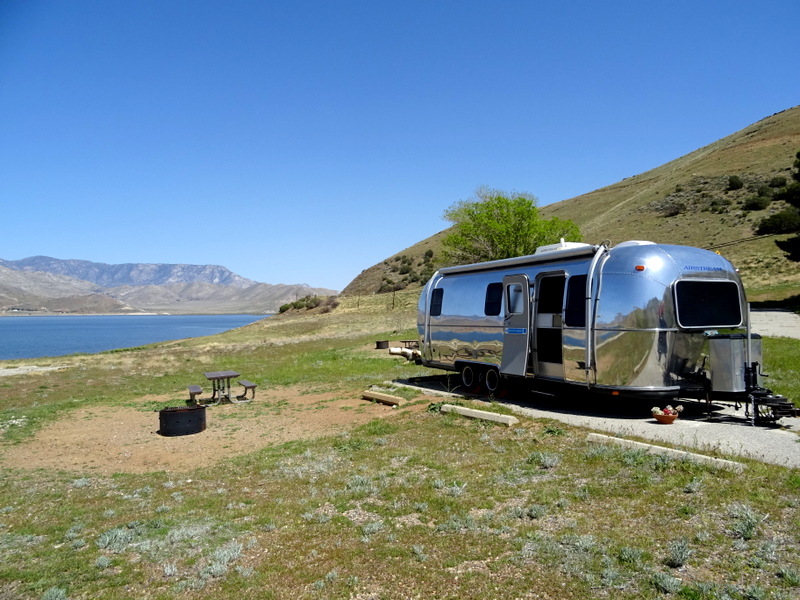 Before having the Airstream polished we made a pact that we would take better care of our newly shinned home. 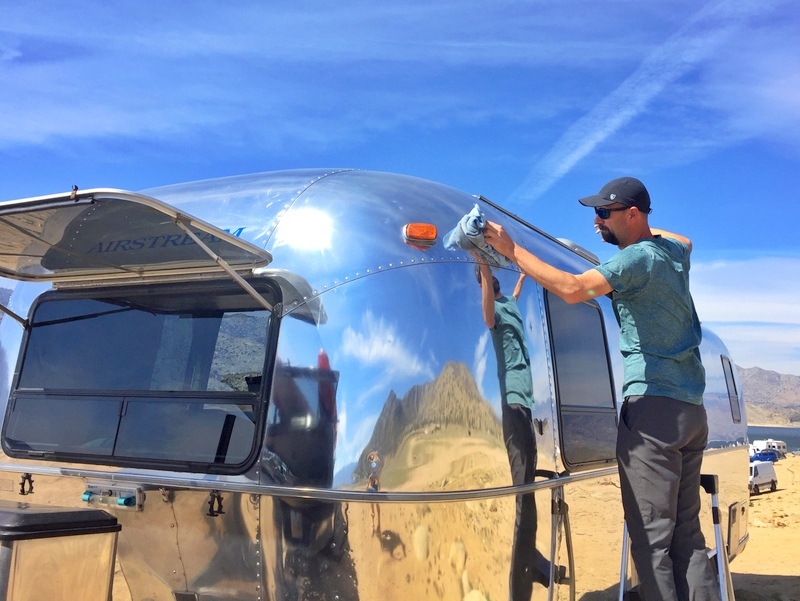 That means wiping off the bugs after we travel, wiping off the water spots after it rains, and not driving down long, dusty dirt roads with encroaching trees that leave behind unsightly scratches. That last one has been our downfall in the past. And while it might mean not exploring those remote places off the beaten path, right now we’re okay with that. And let’s be honest, spending a few weeks at a place like this is not exactly a sacrifice. By Monday morning the holiday and weekend crowds had departed leaving behind only about a dozen RVs scattered around the lake shore. 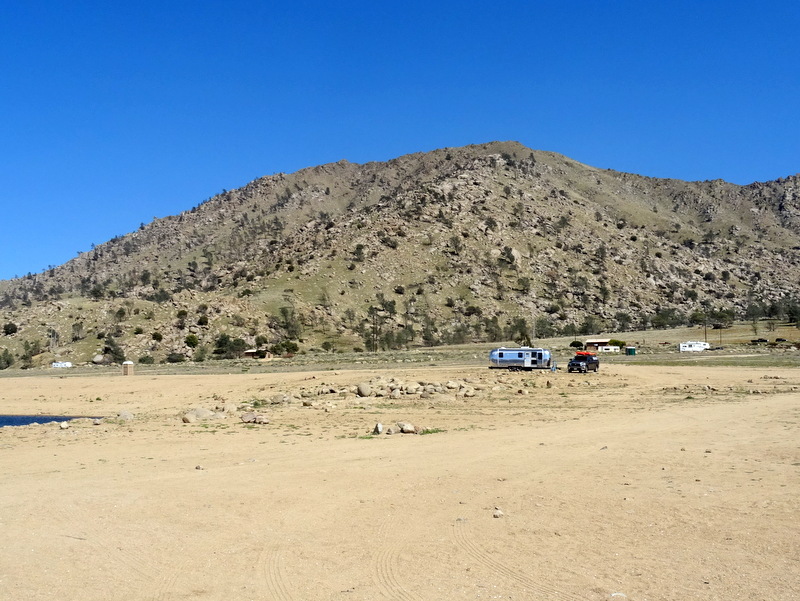 We had seen some photos and a video from a past Memorial Dayday weekend of this camping area and it looks like it gets crazy busy. Fortunately, this early in the season the crowds only show up on weekends and most of our two-week stay was fairly quiet. Except for the wind. Oh man, that wind was strong. We had a few calm early mornings, but by noon almost every day, it would kick back up to a fierce and unrelenting gale. One night we had 40 MPH gusts that kept us awake while our house rattled and shook. 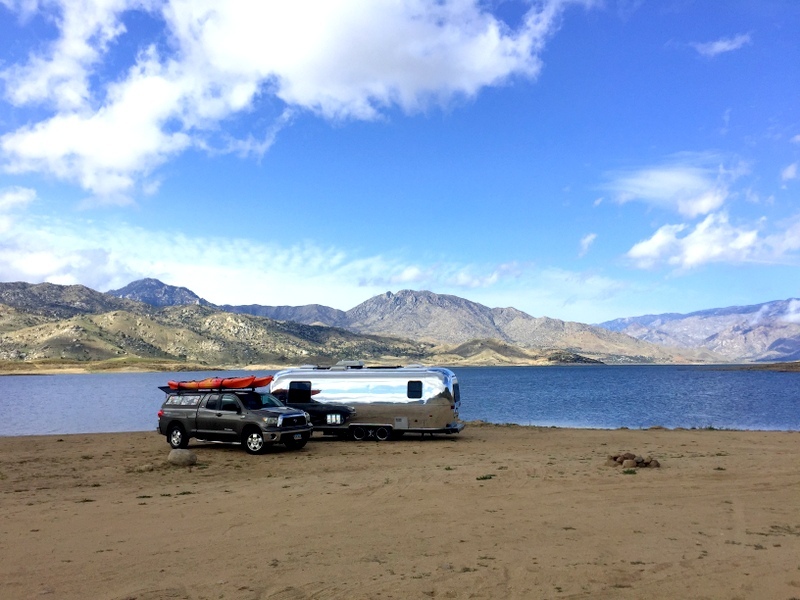 I won’t complain too much because after visiting my mom and stepdad’s fifth wheel during a wind storm in Utah last fall I realized how good we have it. Seriously, it sounded like a tornado was happening inside that RV. While our shorter height, rounded corners, and lack of slides definitely diminishes the impact of high winds, the constant rattling of the awning arms and windows gets old really fast. Near the end of the first week, we moved to a lower spot closer to the shore in an effort to find some relief from the wind. We didn’t exactly get away from the wind but we did position ourselves so the brunt of it was hitting us on the backside and that made a big difference for the comfort level inside. We also got to watch as the water level of the reservoir rapidly rose due to the melting mountain snow. If we had stayed much longer we would have needed to move to higher ground for sure. Out-the-door view on the day we arrived. Same view 5 days later. 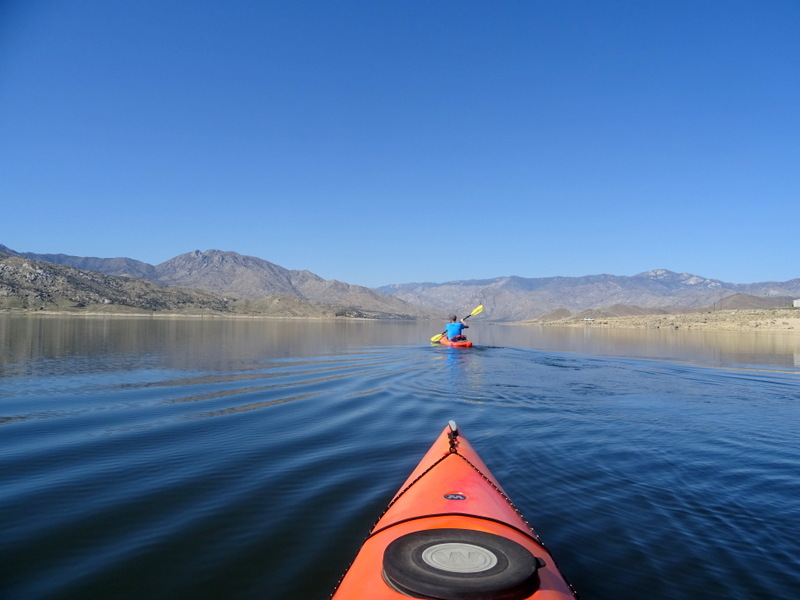 One day the winds stayed away into the afternoon and we went out for a short afternoon paddle. The calm didn’t last long though and with a storm bringing 60-70mph winds on its way, we left a few days short of our two-week limit. 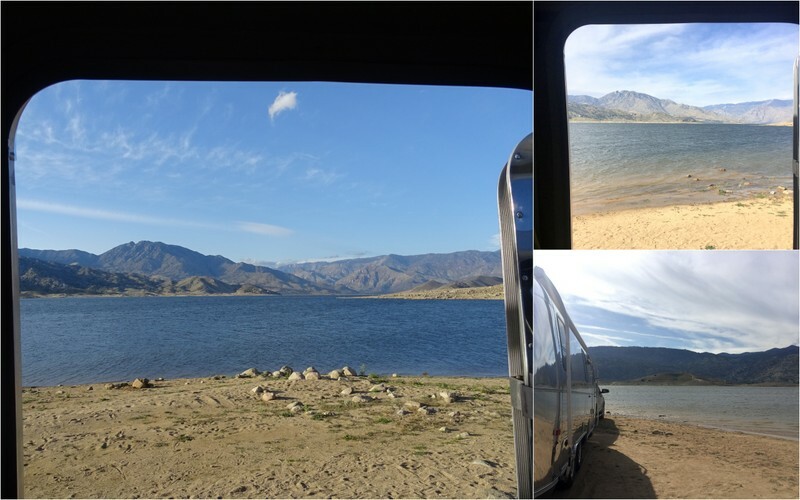 As it was still the middle of the work week we couldn’t go far so we ended up only a few minutes down the road at the Paradise Cove campground. Tucked into a small cove behind a hill this was the perfect place to hide from the high winds. Not the perfect campground by any means, and certainly not worth $28/night, it fit the bill for our last few days in the area. While not inside hiding from the wind we explored the area on foot by tackling a couple of hiking trails. This area offers tons of hiking options and even after two weeks we only tackled a handful of trails. 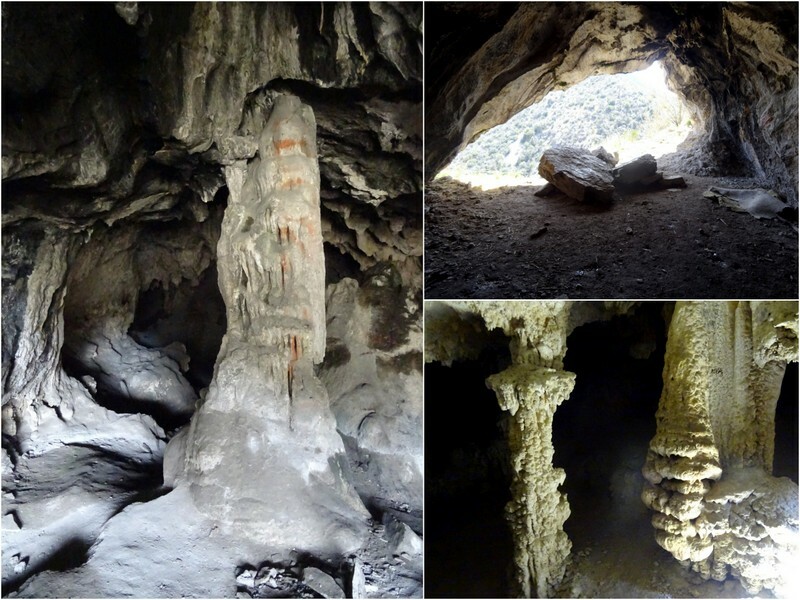 Frist there was the trail that climbed straight up for several miles and ended at an amazing natural cave filled with stalagmites and stalactites. 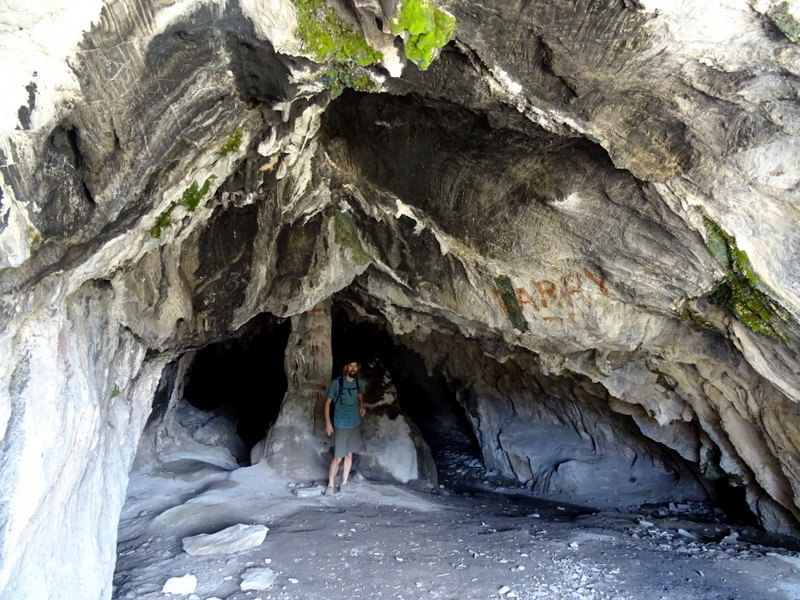 While it was cool to explore a cave outside of a National Park, the amount of vandalism in the form of graffiti and broken off formations was pretty disappointing. Why are people such jerks? 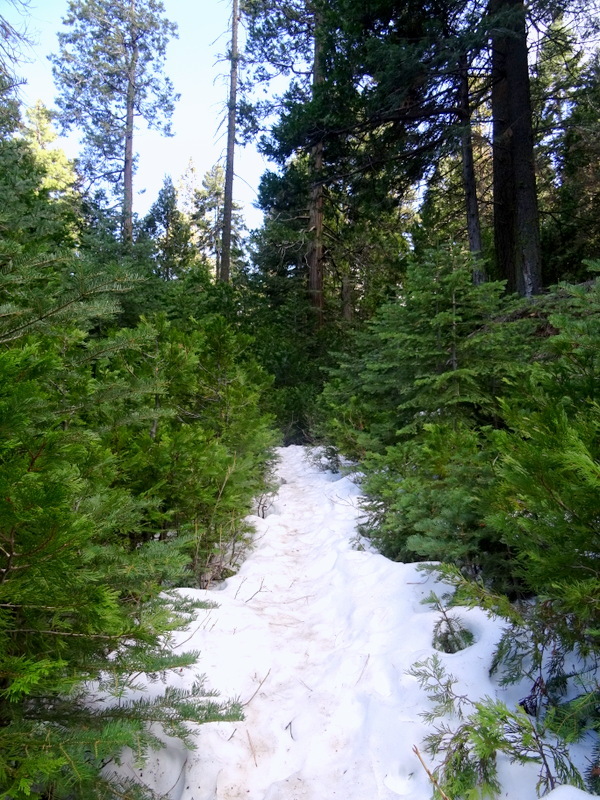 The trail that took us up to 6,000 feet where we found a dense evergreen forest and patches of snow. The trail on the side of the canyon where we startled some grazing cows and enjoyed an easy hike through a forested meadow. 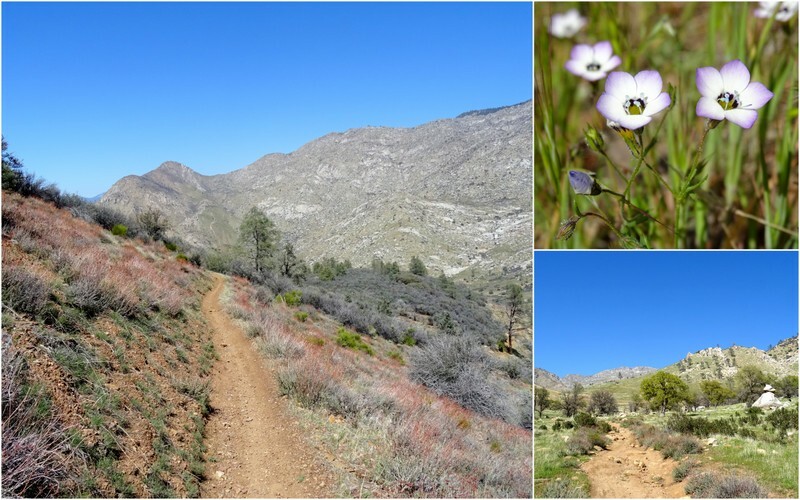 The in-town trail with sweeping views and an impressive display of wildflowers. And finally, the Powers Peak trail that climbed high up on a ridge via a switchbacked track frequented by more bikes (both the peddled & powered kind) than hikers. 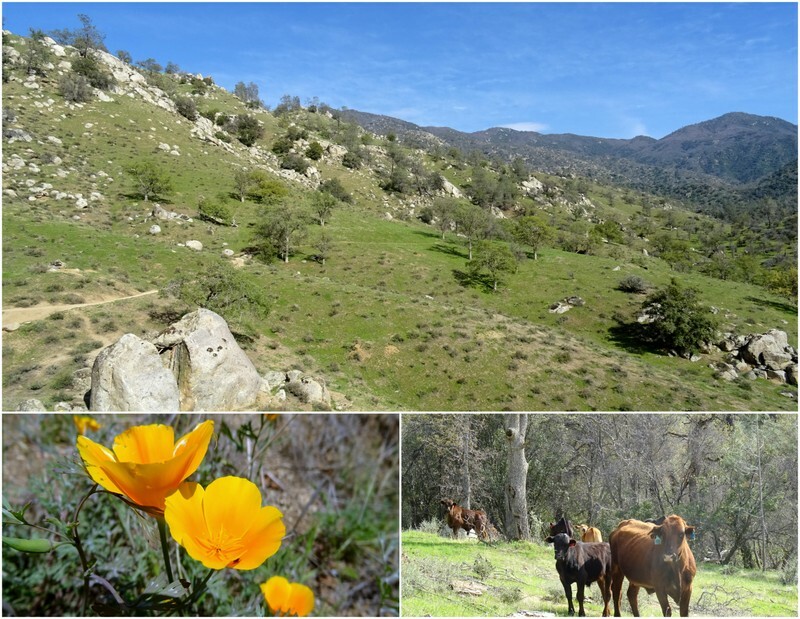 By the end of our two-week stay, the higher elevations near Sequoia & Kings Canyon NP had warmed up and it was time to head to the mountains for real. See you there! Looks like a pretty sweet couple of weeks! We’ve not been there, thanks for the heads up. It was a nice place to spend a few weeks for sure. You and Hans would love all the hiking in the area. There were so many more trails that we didn’t get to! I’m sure it’s beautiful in the fall. The lake will be a lot lower and more shoreline will be exposed so it will look different. But that adds more space for campers to spread out. Don’t get the idea that that is what all California lakes look like! Bill in Trinity County. Yup, the photos I’ve seen of this lake later in the summer look nothing like it does now. Curious about “live infographic” link and clicked it. WHOW! You two have been on lots of roads. Suggestion to all blog followers: Click it. Yes, so many roads! I’m working on a re-design for the blog that will have a more prominent place for the infographic.